...with nearly 700 questions. Each question and passage has been crafted to match the difficulty and style of the exam. Be ready for more than just the content. Practice with the same interface as test day so there are no surprises. With 25+ years of cumulative MCAT experience, our team has designed the exams to be second only to the AAMC's. Great MCAT practice is about quality, not quantity. While some companies rushed to produce several practice exams in a few months, we spent nearly a year carefully reverse engineering the MCAT to create our first 3 full-length practice exams. Our exams have nearly 700 questions designed to mimic the question style, content distribution, and difficulty ranges of the real exam. Each question has been carefully vetted by multiple M Prep instructors to give you the best prep outside of the AAMC. Complete each exam in one session or over multiple sessions - your work is saved automatically. You can start each exam multiple times and return to it at your convenience. 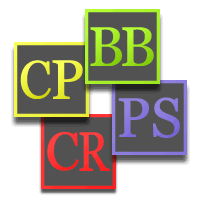 Comprehensive reporting of your performance and full explanations for each question. Track your progress and your performance to identify and target your weak areas. Full percentiles and score predictors coming soon so you can see how you stack up against other test-takers. Based on student performance, our questions stack up very well against the real MCAT. On average, our questions are slightly more difficult, and our performance distribution is very similar. Knowing your raw score as well as your percentile ranking gives you the clearest picture for what you can expect on test day. 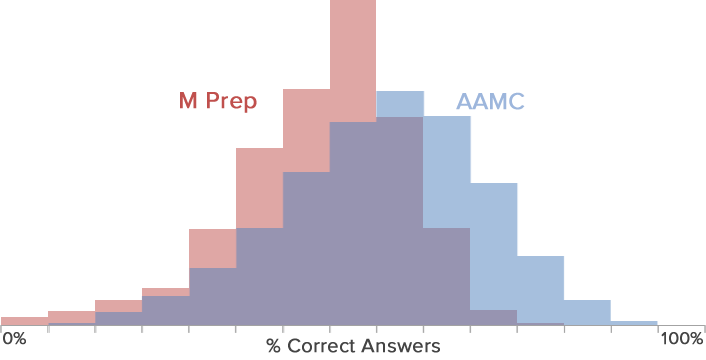 Comparing student performance on M Prep questions (N > 1000) against actual AAMC performance distribution. Normalized by percent correct answers. M Prep performance is shown in red (including overlapping purple region). AAMC performance is shown in blue (including overlapping purple region). On average, students get fewer of our questions right than on the real MCAT, suggesting that our questions are, on average, approximately as difficult if not more difficult than the real exam. I feel like the practice has been a great addition to my studies. Questions are very reasonable and they possess an ideal balance between knowledge-based and critical thinking questions. The practice was amazing in the months leading up to my test, and even doing a few each day gave me increased confidence... and I feel it helped lead to the 36 I received. Without it, I'm not sure I would have realized my potential. I'd highly recommend the practice to those looking for practice on their computer. I feel some of the questions on the chemistry and physics are actually more challenging than the real MCAT. What hapened to the Qbank? Is this the same content? We're doing a massive overhaul of the Qbank content, our old format for passage-based practice. While we're using a lot of the same content, not a single passage has escaped significant updates. Many of the passages and all of the discrete questions are brand new. We're still using the Qbank stats to show the quality of our content, but rest assured that it's even better now than it was before. Is the format absolutely identical to the AAMC format? There are a handful of minor differences, all explained in the practice exam intro. These differences include a single intro page rather than multiple intro pages on test day. The highlighting system has a slight difference, and while you can use Ctrl + F on the AAMC practice exams and our exams, you won't be able to use it on test day. All exams are provided in a convenient online format. Once you register, you'll receive an access code in your email which you can redeem in your student account. If you don't have an account, it's free! How much content is in the exams? There are nearly 700 questions split between 3 full-length practice exams. The number of questions in each section and the distribution of questions between discrete and passage-based questions is the same as the real exam. Will these exams help me if I already have other MCAT study materials? Yes, the practice exams are designed to be valuable practice regardless of other study materials you are using. Many students plan to self-study and want the best resources available, pacing themselves as they go. Why should I use your exams? How close are they to the real MCAT? Nearly 20 people - content experts and MCAT experts - were involved in the creation, vetting, and curation of our practice exams for nearly a year. We agonized over every detail so their quality is absolutely representative of what you will experience on test day. We could have rushed development and spit out 10 exams in a few months, but we took our time because we want our consistency and quality to be the best in the business.